The countdown stands at less than 60 days until we hear those magic words, “Drivers, start your engines!’ and 14 teams have been busy during the offseason preparing as well. Testing new cars, new drivers, new crews, this is not going to be a repeat season of the same old one bit. This year the cars have seen many improvements during the off-season, most notably the aero-kits on the front. There have also been changes in the overall contour of the body to reduce drag even more. Five of the eight teams recently tested the newly designed cars and though it not a qualifying event, it offers an opportunity to evaluate and make modifications to the car. In testing, the top speeds were recorded by Graham Rahal and Takuma Sato of Rahal Letterman Lanigan Racing. Sato took the fastest lap speed of 189.855 mph, and Rahal with 189.090 mph, respectively. Sato was the fastest three out of four times during the four three-hour test sessions. Also in testing was Scott Dixon of Chip Ganassi Racing in his new PNC Bank Honda with the addition of a windscreen which is being evaluated by Indycar. This was the first on track test of the windscreen, and there is still much more testing to be done before a decision is made by Indycar officials. And if you did not notice that Takuma Sato is now part of the RLL team, there have also been other changes within the teams this year. Ed Jones is now one of two drivers for Chip Ganassi Racing. In previous years CGR had a stable of four cars and drivers, but has now paired down to Dixon and Jones. And to have Scott Dixon as a mentor will be something we should all be watching. 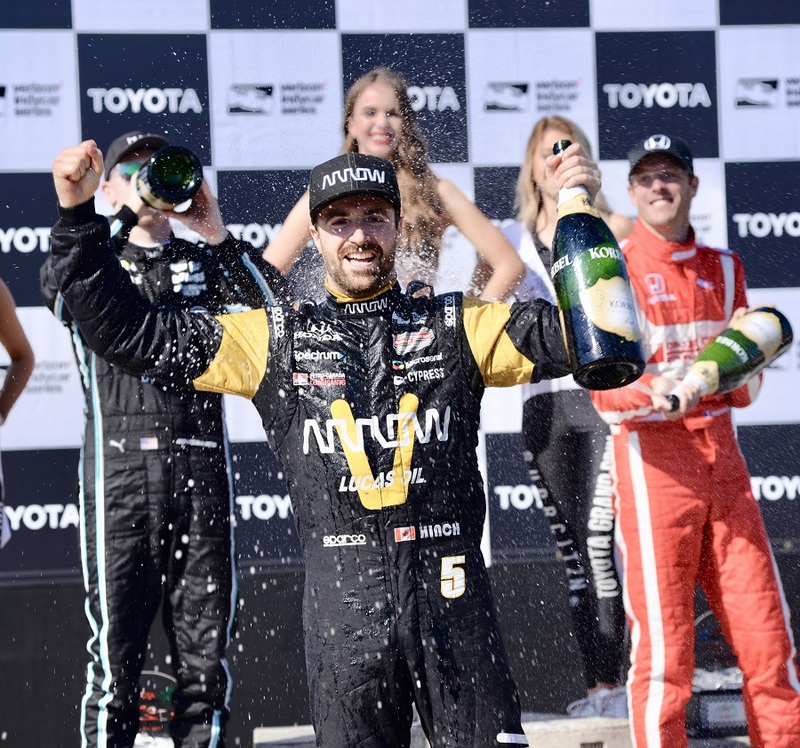 James Hinchcliffe will be joined by friend and fellow Canadian Robert Wickens on the Schmidt Peterson Motorsports team. Wilkens will be an interesting addition to SPM, as his background has covered so many types of racing, and has proven himself in every single category. Tony Kanaan is moving to AJ Foyt Racing in the position left by Sato’s move to RLL, and will be joined by Zach Veech in the No. 26 car, while AFR undergoes many other changes in the 2018 season. Helio Castroneves is still part of the Penske team, but is now in the No. 33 in IMSA in a decision made late last year between the team and driver. If he takes the pole with IMSA, would it count as three in a row for the last three years in Long Beach? I think it would go to Helio. Racing is racing. Max Chilton and Charlie Kimball are now a part of Carlin Racing. The UK based team currently competes not only in Indycar, but Indy Lights, FIA Formula 2 & 3, Euro Formula Open and the BRDC British F3 Championship. Overall they have an impressive 24 championship titles including their first Indy Lights title in 2016. Dale Coyne Racing brings on board Zachary Claman DeMelo and Pietro Fittipaldi, both taking turns during the season in No. 19. The drivers will be splitting the season in the same car, and Zachary is slated to drive in Long Beach. DCR is also being joined in a limited partnership by none other than racing legend Emerson Fittipaldi. Ed Carpenter Racing features not only Ed Carpenter, but Spencer Pigot in No. 21 and sharing the No. 20 is Jordan King. In 2018 Carpenter will be at the wheel on the ovals, giving the streets of Long Beach (and the remaining street courses) to King. Harding Racing is home for Gabby Chavez from Columbia. Chavez comes to Indycar from four victories and eleven podium finishes in Indy Lights. Chavez also brings experience from IMSA and Karting, as well as victories in Formula BMW Americas. Suffice it to say, there are many changes not only in the cars, but in the teams, drivers, partnerships and challenges. 2018 Indycar is going to be different in many ways. Old teammates will be friendly rivalries, old friendly rivalries will turn into teammates. New teams bring new crews and drivers to be tested and driven to win. But that is what this sport is about. Constantly changing and improving. The days are ticking down, and so are the best seats. But did you know there are other options than just general admission and grandstand seats? There are several club seating packages available which offer preferred seating, and other perks. These are more, but worth every bit of the cost. Which would you prefer, leaving your seat for a beverage or table service? Each club has its own perks depending upon the level, so please check before you decide which option best suits your style. Featured photo of James Hinchcliffe celebrating a win last year by Dave Newell.